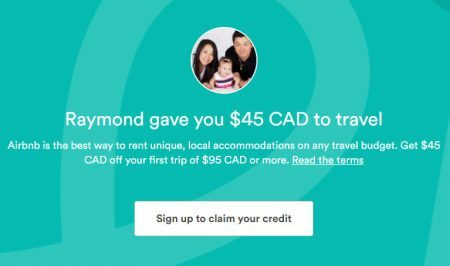 Airbnb.ca: FREE $45 CAD Travel Credit! Airbnb.ca is the best and cheapest way to rent unique, local accommodations on any budget, anywhere in the world. Ever since I first heard about the Airbnb, it’s the first place I check whenever I need to book a room or a place to stay. It’s safe and you’ll find lots of amazing deals that’s much cheaper compared to a standard hotel room. Airbnb offers a huge selection of vacation rentals, apartments, homes, rooms, cabins, castles, etc… for rent in 34,000 cities. I recommend checking out Airbnb if you need to rent a place or have something you would like to rent out. For a limited time, click on any of the links in this blog post when you sign-up for an Airbnb account and you’ll get a FREE $45 CAD travel credit towards your first booking of $95 or more! Sign-up now while the offer lasts. Airbnb has over 60,000,000+ guests and 2,000,000+ listings worldwide in 190+ countries. This means you can find just about anything, anywhere. Seems like everyone I talk has rented something on Airbnb and highly recommends it. You can find some awesome deals if you search around. Founded in August of 2008 and based in San Francisco, California, Airbnb is a trusted community marketplace for people to list, discover, and book unique accommodations around the world — online or from a mobile phone. Whether an apartment for a night, a castle for a week, or a villa for a month, Airbnb connects people to unique travel experiences, at any price point, in more than 34,000 cities and 190 countries. And with world-class customer service and a growing community of users, Airbnb is the easiest way for people to monetize their extra space and showcase it to an audience of millions. Click here to visit Airbnb.ca to get your free $45 travel credit or for more details about the website. Click here to visit my other site RayTravelsFree.com for more travel hacking tips and deals. CalgaryDealsBlog.com is updated daily and features the best and hottest deals of the day, sales, coupons, freebies, discounts, daily deals, group buying, travel, local & online deals in Calgary, Alberta, Canada. Save up to 50-95% Off! Join our free daily mailing list and never miss a deal again! Copyright © 2010-2019 Calgary Deals Blog. All Rights Reserved.